Are you curiously googling or searching torrents for photos or videos of Emma Watson, Amanda Seyfried, Rose McGowan, or any other celebrities leaked in The Fappenning 2.0? "VIDEO: WWE Superstar Paige Leaked Pics and Videos"
"Incredible!!! Leaked Pics and Videos of WWE Superstar Paige!!!! : [url] (Accept the App First)"
For accessing the content, scammers told you to first install a twitter app called "Viral News." 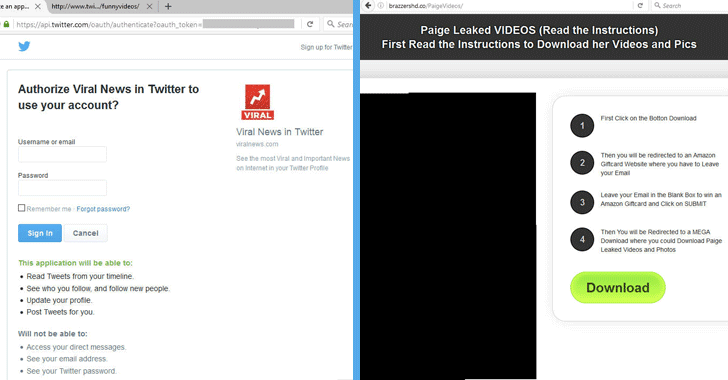 In the hope of a glimpse of Paige's video, victims tricked into giving the malicious app permission to access their Twitter account, update their profile and post tweets on their behalf. Raise your Eyebrows when asked for something in return. Beware of any site that asks you to download and install software in order to view anything else, in this case, photos and videos of Paige. This is a known tactic of spreading scam.